This adorable bunny was just born and needs your love and attention! Give her lots of affection by petting the soft fur on her back. 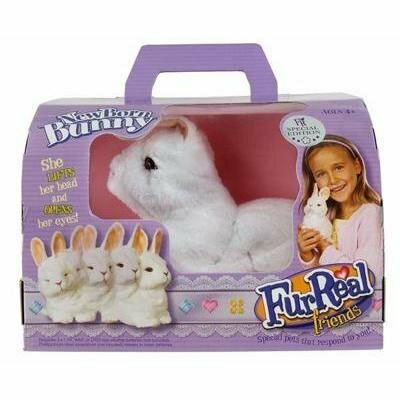 She’ll make baby bunny sounds and then gently lift up her head to look at you! Keep petting your new companion and watch as she continues to wake up and become playful. Newborn bunnies are very, very sleepy… if you stop petting her, she’ll lay her head down and fall back asleep again! The more you love and play with your newborn, the more she responds and loves you back! Plush bunny figure comes with adoption certificate. Requires 3 AAA batteries.